I ran the 5k on Saturday and “raced’ the half on Sunday. Warm and humid, and hilly, plus coming off a cold earlier in the week meant a pretty ugly race. My time was 1:43:17. Our holiday tradition! We always find a turkey trot to do, this was a flat but warm race. I was 7th woman and first in my age group. Couldn’t quite break 21 minutes, made it in 21:13. In town before Thanksgiving, did this women’s only trail race. Lots of hills! Finished 3rd overall. Quick trip to Michigan to add another state to Suellen’s quest for 50. Race was on the air national guard base, and very well run. 1st woman overall, 43:39. Visting family in Salt Lake City, we hopped over the border for small local race. A little faster, 44:14, and second woman overall. Plus, baked potatoes after the race! Great costume race, I ran as a giant Hershey Kiss. I was 3rd woman overall, in 45:02. Not super fast but at least trying get some of the rust off. Little untimed neighborhood trail race, with donuts at the finish! Enjoyed the race and then ran with the granddaughters in the Kids K.
Ran this with Suellen, at her pace. It was a fun race and neat place to visit. The big race! My first full Ironman. Weather was perfect, not too warm. I raced according to plan, finished pretty strong, and was about 30 mins faster than my expected time, in 12:16:12! Warmup sprint tri the week before Ironman, and the last of the Wisconsin Tri Series. Raced strong but controlled, and ended up 4th woman with a 1:16:45 time. Dropped down to the sprint race after the bad 70.3 the week before. Good decision and I had a nice race, 4th place woman at 1:10:57. Hot and sunny! And miles and miles of bad roads. Tried to go conservative on the bike, but still blew up on the run 🙁 Final time 5:39:28. Nice smaller local sprint tri, on a flat course. Another 3rd woman overall, in 1:12:57. Very hilly bike course! Didn’t run as fast as I hoped, but ended up 3rd woman overall in 2:30:24. Gradually getting back into longer tri’s to prepare for Ironman, this race went very well and I finished 3rd elite woman, in 2:34. Beautiful race, I ran it with Suellen and enjoyed the scenery. 3000 feet of descent over 13.1 miles! Blew away my half marathon PR, in 1:27:09. The downhills really beat up my legs the couple days after, but it was worth it. 8th woman overall and 1st in my age group. A great local race, very challenging hilly and scenic course. It’s always my birthday weekend, it seems. I was about 40 seconds slower than last year, at 1:29:36. 2nd place in my age group, the woman who beat me by 6 seconds this year, also beat me by 5 seconds last year! Ran with a great group of ladies. (That I had only met on Facebook before the race!) A really fun event, and a challenging course. I ran a 42:53. Took a trip back to my home town of Austin, and ran this trail race southeast of town. The weather was perfect, and the trails were challenging. I finished around 1:47, and was the 4th overall woman. Ran this with Suellen, it was cold and rainy, but still fun. There were lots of spectators despite the rain. Took the kids & grandkids on a Disney cruise, and we got to run this casual 5k on the island! I ran just under 20 minutes, 2nd woman and 2nd overall. Snow returned and we actually got to snowshoe! I finished first woman, in just over an hour, 1:00:10. Lack of snow turned this into a trail run instead of showshoe race, but it was a wonderful time out in the woods on the trails. I was first woman overall, in 50:33. A great weekend at Disneyland. 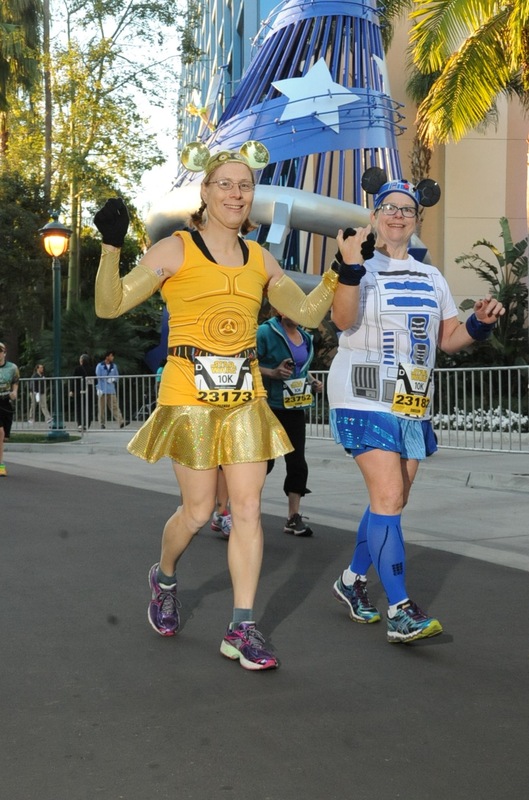 I ran the 10k easy with my partner (dressed as C3P0 to her R2D2). 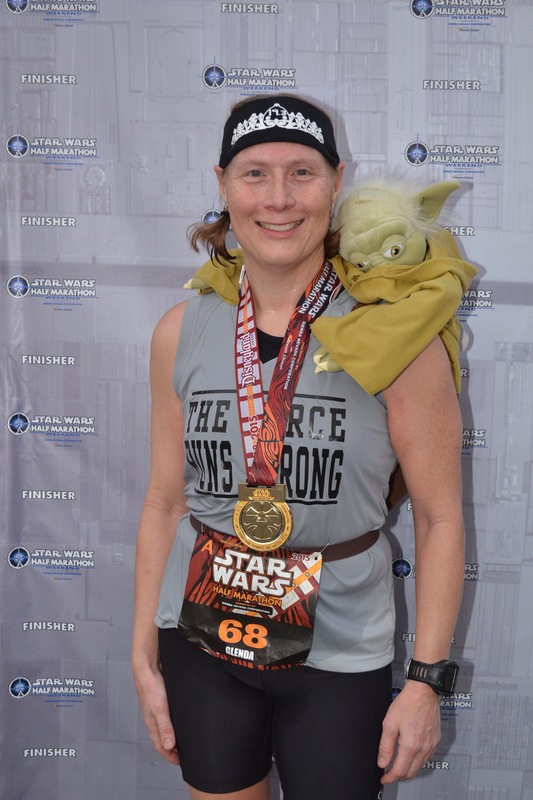 The next day I ran the half marathon with Yoda on my back the whole way.